This Vegetarian Health Nutrition Fact Sheet can help you pinpoint the most important nutrients to consider while planning a nutritious vegetarian diet. Carbohydrates - which are found liberally in legumes, grains, fruits and vegetables. In general, anyone eating adequate calories doesn't need to worry about getting enough carbohydrate nutrition on a vegetarian diet. Protein - you need to eat eight different types of amino acids – the building blocks of protein. Most plant foods don’t include all eight essential amino acids, so they are considered as ‘incomplete’ protein sources. 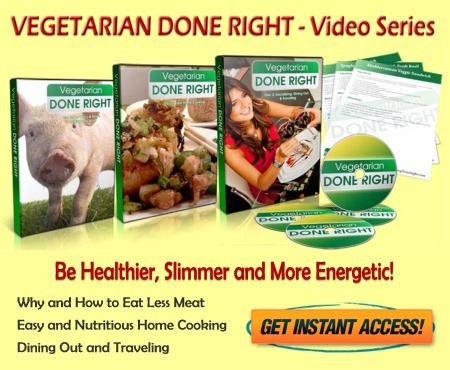 A varied vegetarian diet does include them all – just from different sources. Your body keeps a pool of the amino acids it needs, so be sure to eat a variety of different high-protein foods through the day. Good vegetarian sources of protein include legumes (such as beans, lentils and peas), nuts, seeds, grains, soy products (tofu, soy milk, veggie burgers, etc. ), dairy products and eggs. The recommended daily allowance (RDA) of protein for good health is 0.8 g (grams) per kg of body weight. For example, a 130 pound sedentary adult needs 47 g of protein per day. This nutrition requirement increases with activity, and an adult who exercises regularly needs about 70 g of protein per day. Fat - found in vegetables oils, salad dressings, mayonnaise, nuts, seeds, dairy products and in most baked goods. The omega 3 essential fatty acids found in oily fish are also found in rapeseed oil, flax seeds and walnuts. Various vitamins and minerals are also important to human health. A well-balanced vegetarian diet can supply most or all of the nutrition that's needed, especially if fortified foods are chosen regularly. A comprehensive vitamin and mineral supplement would be good insurance for anyone on a vegetarian diet. Base most of your meals on these foods. Use wholegrain versions as much as possible and avoid adding lots of fat. These foods provide carbohydrates for energy, fiber, protein and some vitamins and minerals. Include a variety of legumes (also known as pulses - beans, chickpeas, soy products, etc. ), nuts, seeds, and eggs for protein, minerals and vitamins. Good sources of calcium, protein and some vitamins. If you are avoiding dairy foods, choose fortified soy, rice or oat drinks or make sure that you eat other foods that are high in calcium. Fresh, frozen, juiced, canned or dried fruit and vegetables are good sources of vitamins, minerals and fiber. Although you need to eat some fat, eat these foods sparingly and try low-fat alternatives. There are additional nutrients to consider when planning a balanced vegetarian diet, which fall outside of the scope of this vegetarian health nutrition fact sheet. The so-called 'vegetarian vitamins' are nutrients that deserve special emphasis to ensure robust good health while on a vegetarian diet. 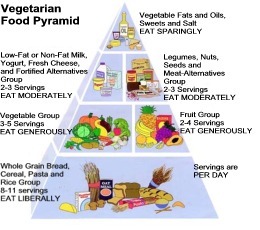 With a little forethought and planning, vegetarians can easily meet all their nutritional needs.